It’s been one year since the dust settled after the chaotic launch of Pokémon Go and in just one day players will have the opportunity to defeat their first legendary pokémon. Beware the crazy people. 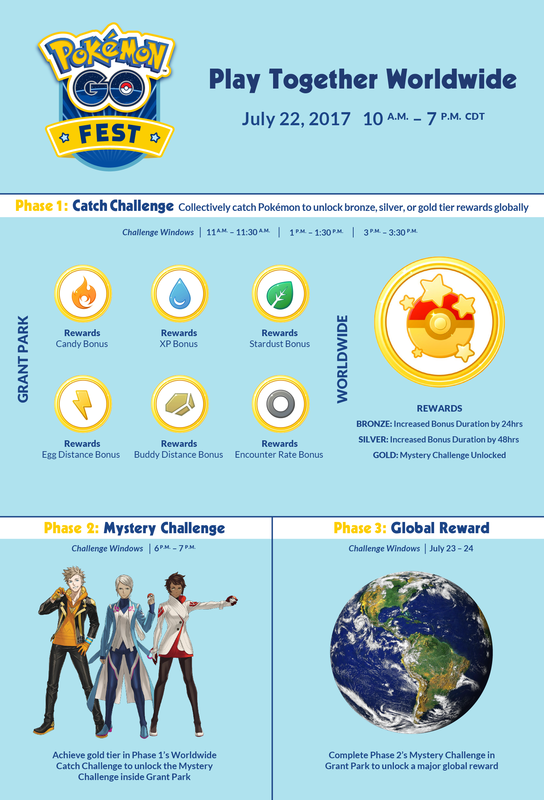 Tomorrow on July 22 a sequence of Pokémon Go challenges will happen in Grant Park, Chicago, USA. There will be two local events that are restricted to the park area, the “Catch Challenge” will be to capture enough pokémon in 30 minute windows three times: 11:00 am to 11:30 am, 1:00 pm to 1:30 pm, 3:00 pm to 3:30 pm. If trainers are successful in capturing enough pokémon to unlock the gold tier they will unlock the Mystery Challenge, which contains the game’s first legendary pokémon. If unlocked, the legendary pokémon will appear in Grant Park. Defeating the legendary pokémon will be possible between 6:00 pm and 7:00 pm. If the trainers in Grant Park manage to defeat it they will have completed the challenge and unlocked facing the legendary pokémon in raid battles across the world. According to an infographic from developer Niantic, the opportunity to raid against this legendary pokémon will only be available between July 23 and July 24. The whole event will be streamed on Twitch, you can head over to their channel if you’re interested in keeping track of what’s going on. In addition to the legendary event, there are also going to be a series of Safari Zone events across Europe come August and September. During this event, trainers will be able to catch many different pokémon, including some that until now have only been available elsewhere. Depending on where you live, however, you may be more or less excited by this. The event will be limited to Unibail-Rodamco locations and will only be available for one day at each location. August 5, trainers will be able to participate in Copenhagen, Denmark and in Prague, Czech Republic. Following that, the event will take place on August 12 in Amsterdam, The Netherlands and in Stockholm, Sweden. The final Safari Zoo takes place on September 16 across three locations; these happy few are Oberhausen in Germany, Paris in France, and Barcelona in Spain. There will be team lounges for those that want to hang out with other pokémon trainers from your team, whether you’re Instinct, Mystic, or Valor. Finally, another event announced by Niantic is a special collaboration event together will the annual Pikachu Outbreak event in Yokohama, Japan which occurs between August 8 and August 15. Pokémon Go was enjoyed by hundreds of millions of players across the world upon its release. It was the cause of over 100,000 traffic accidents and players occupying parks were commonly reported online. Considering the size of this event, it wouldn’t be too far fetched to assume we at the very least might see large crowds gather to take on the game’s first legendary pokémon. Because hey, isn’t that what everyone has been waiting for?